You put that code to any button that you want the locker to appear with when clicked. I dont have the option to see this.. I mean I can select the domain option and thats all I dont have any other option after this.. you have skype to explain me this please ? 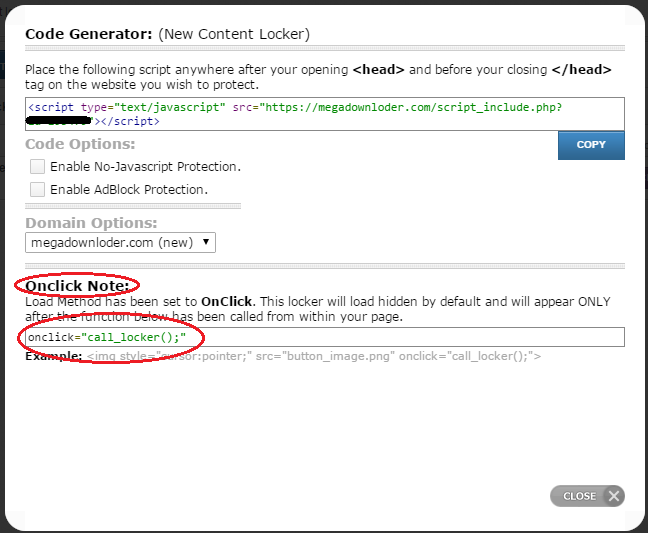 Edit content locker - Load method - on click. Then you will see code for "onclick"
(2015-10-07, 04:52 PM)Diem Wrote: Edit content locker - Load method - on click. Then you will see code for "onclick"
Can you please check your capslock before you post? this is seriously annoying to read! (2015-10-08, 12:31 AM)DutchPride Wrote: Can you please check your capslock before you post? this is seriously annoying to read! Dutch beat me to it... again. You may have not known that, but as in real life screaming is very rude.